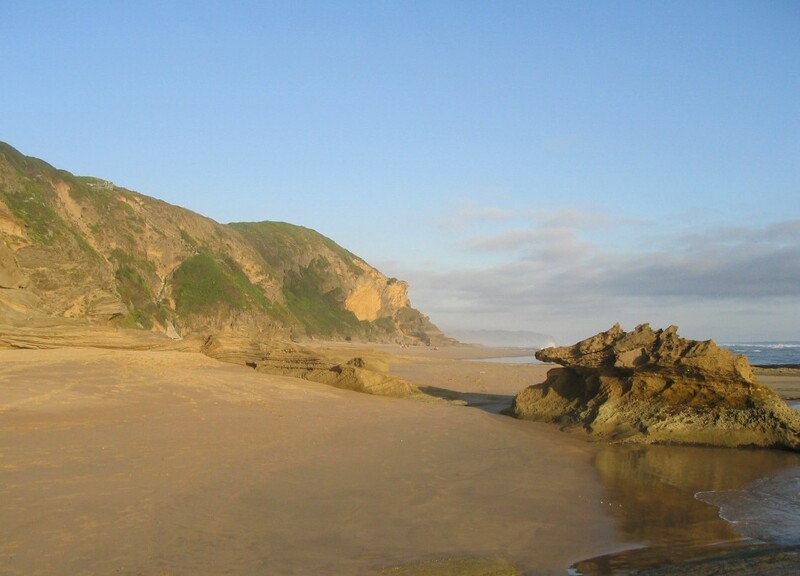 Our holiday home (three star grading) is situated on the eastern dune in Wilderness, an exclusive area that is renowned for its privacy and virgin beach with unique cliff formations - unspoilt by human development. It is close to the sea (100 m): one can hear the caressing sound of waves and walk to a secluded beach in five minutes. As we are located on the southern slope of the largest dune at the point where the beach road is the furthest away from the highway, we are fortunate to have no traffic noise. La Retraite Wilderness is the ideal destination for people in pursuit of peace, privacy and harmony with nature. The serenity and magnificant views may help to bring poetic insights and to restore creativity: a "retraite" in the true sense of the word. The variety of restaurants and the calm lazy air about Wilderness makes it the perfect place to relax and recharge your batteries. Click on the photo (thumbnail) to see a larger picture. The double story house (Floor space: 225 m²) is ideal for two families of four (8 people) or one large family or group of friends. It has four bedrooms and three bathrooms. The top floor is an open plan kitchen/dining room/lounge. It has direct access to wooden decks. 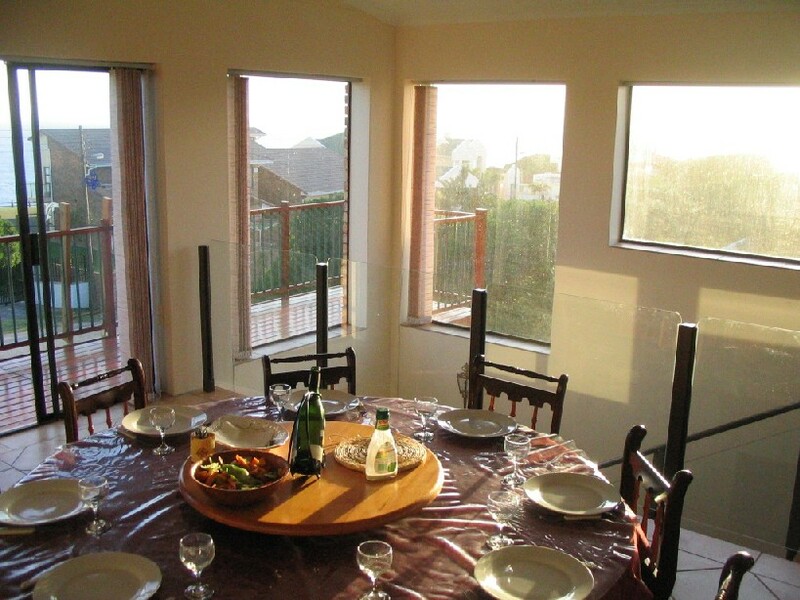 The larger northern deck offers an excellent view of the Outeniqua Mountains. From the southern deck a superb view of the ocean and the bay can be enjoyed, especially during the summer months when the sun sets over the sea. 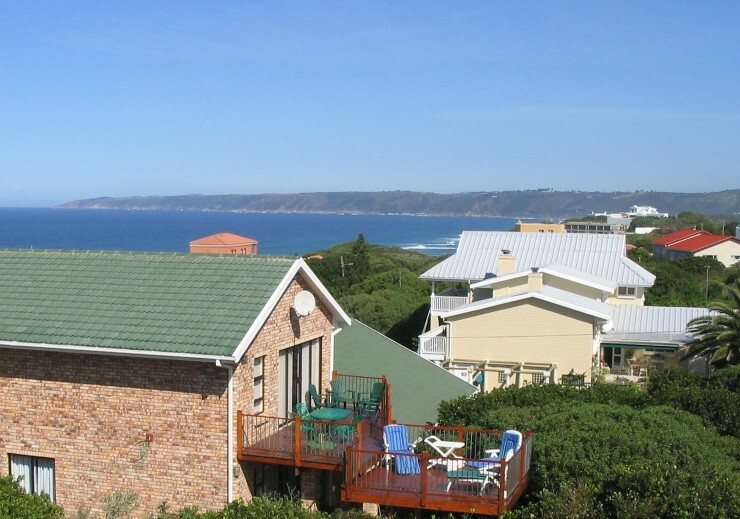 A large garden, a barbecue/braai under shady milkwood trees, four covered terraces, three wooden decks, satellite TV and a DVD player with high fidelity sound, a desktop computer with Internet access and a spacious tiled double garage/play room constitute a venue for entertainment in all weather conditions. The top floor is an open plan kitchen/dining room/lounge. 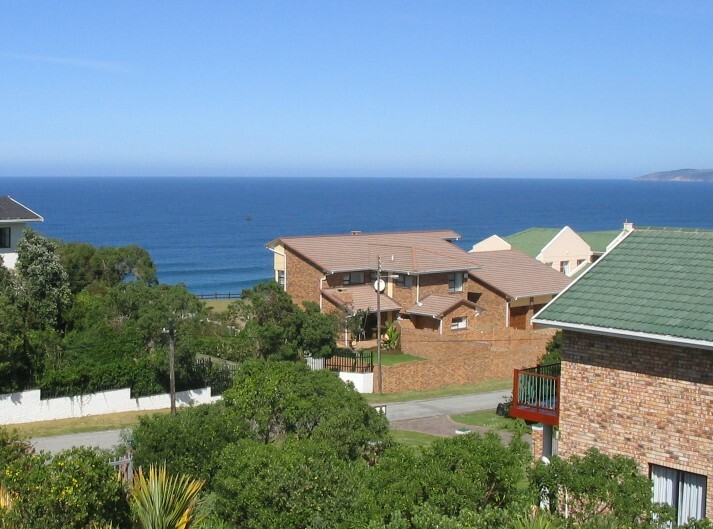 It offers superb views of the ocean, the bay and the Outeniqua Mountains. The kitchen is well equipped with beautiful cabinets (Burmese Teak and Cape Yellowwood) and quality integrated German appliances made by Bauknecht, Bosch, and Siemens. Careful optimisation at the technical level has made the operation of the refrigerators, freezer and dishwasher almost inaudible. a Large hot tray and microwave are also available. Meals are served at a large, circular dining table with ten "Volkwyn" chairs made by one of the finest cabinet makers in the Western Cape. 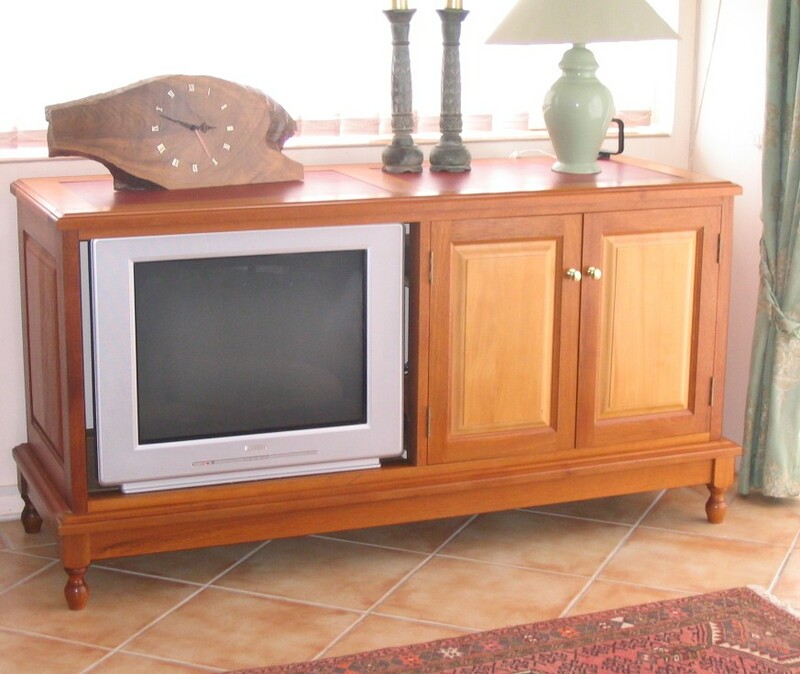 Satellite TV (DSTV), a DVD player and high fidelity sound are available in the lounge. All bedrooms are fitted with panel heaters, ceiling fans and glass sliding doors which give access to the outdoor entertainment and braai/barbecue under large milkwood trees. The bedrooms are furnished with beautiful free standing wardrobes (made in the finest solid wood) to eliminate mildew that plagues built-in cupboards close to the sea. Please visit our floorplans page to see the location of all the furniture in the house. The western unit consists of two bedrooms, each with its own bathroom. The main bedroom has a queen-sized bed with a traditional Cherry wood headboard (imported from the USA) and is right next to the garage. It features a classic kidney shaped desk, a large dressing table and two gable top wardrobes (Imbuia wood). Bedroom 2 has two single beds, two wardrobes and a dressing table (beautiful Kiaat wood). 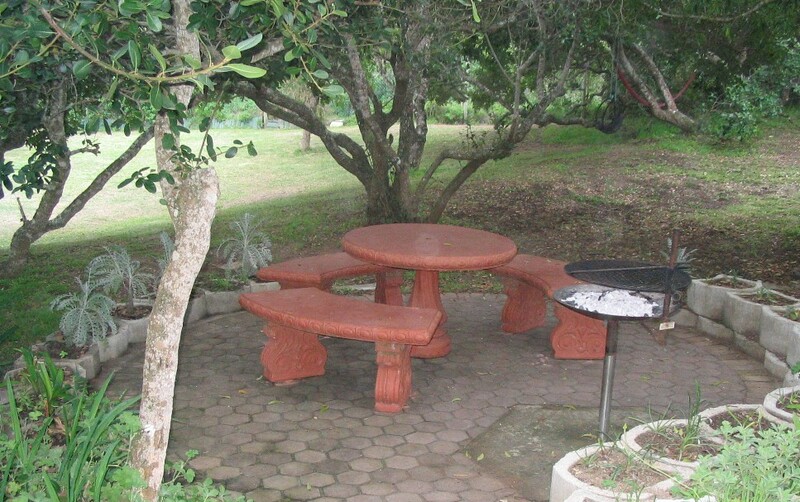 It is next to the barbecue area under the milkwood trees. Both bedrooms have access to a covered patio. Two heated towel rails are available. The eastern unit consists of two bedrooms. 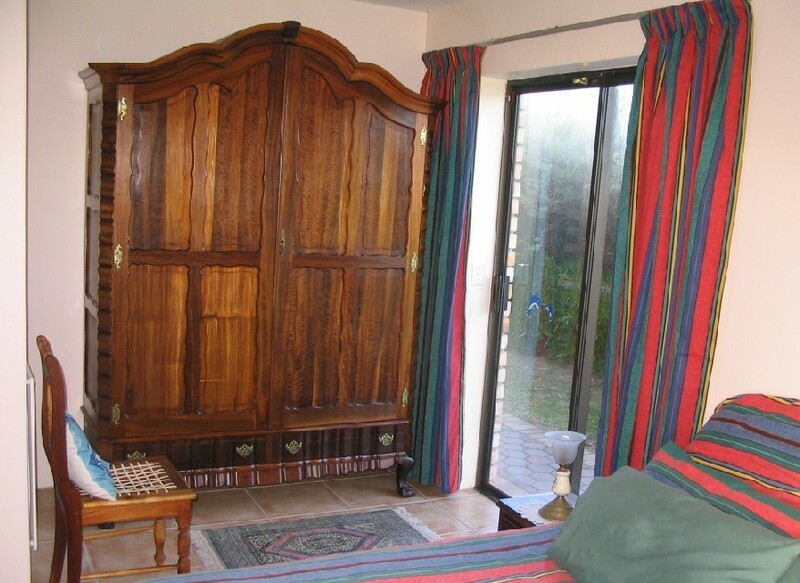 Bedroom 3 is slightly larger and has two single beds, a large Stinkwood and Cape Yelowwood cupboard (Cape country style), a large double wardrobe and a mezzanine. It is equipped with sattelite TV. Bedroom 4 has its own bathroom with toilet, shower and basin. It is furnished with a queen-sized bed, a beautiful dressing table (Blackwood) and a magnificent gable top wardrobe (Stinkwood - the "king" of South African indigenous woods). Our laundry has an automatic washing machine (Speed Queen) and a tumble dryer (Speed Queen). The house features excellent security: a double lock up garage, electronic alarm, armed response, and a safe to store valuable items. A desktop computer is available to connect you to the internet. "In the Wilderness build me a nest, and remain there for ever at rest." Since then, Wilderness has been associated with peace and tranquility. Peace, like every other rare and precious thing, doesn't come to you. You have to go and get it. In this regard, La Retraite Wilderness has a lot to offer. The closest beach is regarded by many international tourists as one of the most beautiful in the world - the only part of Wilderness bay that is unspoilt by human development. Nature lovers are spoilt for choice at La Retraite. A walk along the Pied Kingfisher Trail to the lake and the forest may reward one with a glimpse of rare bird species such as the Giant Kingfisher or the famous Knysna Loerie. The warm waters of the Indian Ocean, the sandy beaches and the lakes provide many opportunities for water sports. Two paddle skis, a canoe and two mountain bikes (Cannondale) are available by prior arrangement. 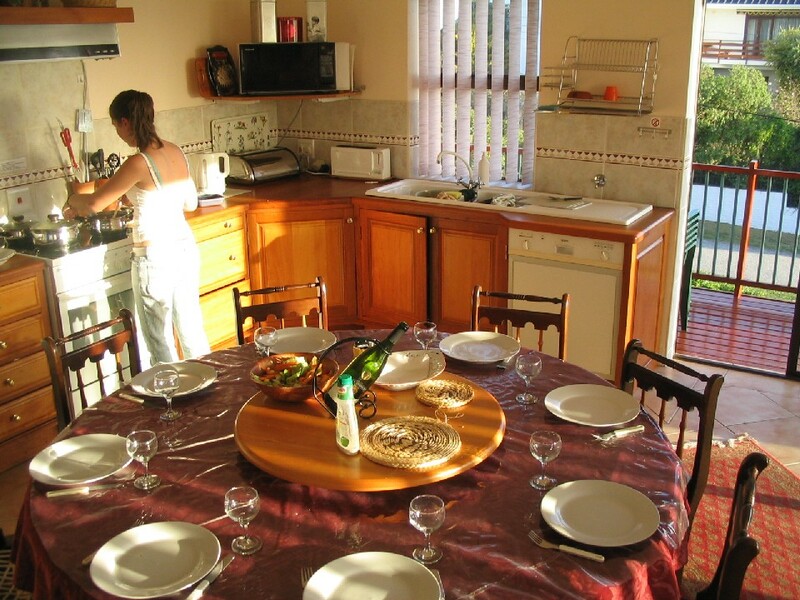 Our mission is to provide accommodation for people in pursuit of peace, privacy and harmony with nature. The serenity and magnificant views may help to bring poetic insights and to restore creativity: a "retraite" in the true sense. We are committed to consistent delivery of very good quality (three star grading) in the overall standard of furnishings and service. We participate in the National Star Grading Scheme of The Tourism Grading Council of South Africa. We agreed to have our establishment regularly assessed by an accredited assessor and to abide by the code of conduct of the Tourism Enterprise. 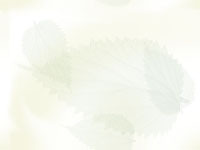 La Retraite Wilderness has accredited membership of Wilderness Eco-Tourism Association. Send mail to dtnel@iafrica.com with questions or comments about this web site.